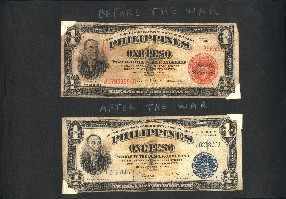 Bills from the Philippines. Note the handwritten captions that say "Before the war" above the top bill, and "After the war" above the bottom bill. On the reverse side of the bottom bill is the word "Victory".